Casa de Patrick White en el número 20 de la calle Martin en Centennial Park, cerca de Sídney. Flaws in the Glass (Grietas en el espejo), 1981. Happy Valley (El valle feliz), 1939. The Living and the Dead, (La vida y la muerte), 1941. The Aunt's Story (La historia de la tía), 1948. The Tree of Man (El árbol del hombre), 1955. Riders in the Chariot, (El carro de los elegidos), 1961. The Solid Mandala (Las esferas del Mandala), 1966. The Vivisector (El vivisector), 1970. The Eye of the Storm (El foco de la tempestad), 1973. Fringe of Leaves (Una orla de hojas), 1976. The Twyborn Affair, (El caso Twyborn), 1980. Memoirs of Many in One, 1986. Thirteen Poems, 1930 (bajo el pseudónimo Patrick Victor Martindale). The Ploughman and Other Poems, 1935. Return to Abyssinia (Regreso a Abyssinia), 1947. Four Plays (Cuatro teatros), 1965. ↑ «El País». elpais.com. 1 de octubre de 1990. Consultado el 17 de diciembre de 2009. Nobel Lectures, Literature 1968-1980, Editor-in-Charge Tore Frängsmyr, Editor Sture Allén, World Scientific Publishing Co., Singapore, 1993 (en inglés). 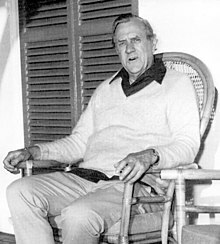 Página oficial de los Premios Nobel: Patrick White (en inglés). Patrick White - Existential Explorer by Karin Hansson (en inglés). Why bother with Patrick White? (en inglés). Patrick White en Pegasos (en inglés).